Jason Shadrick is “On Location” at the Mark in Moline, Ilinois. Guitar tech Chris Miller shows Jason a few of the guitars that Keith Urban uses on the Get Closer World Tour. Be sure to check out part 2 where Chris shows Jason around Keith Urban’s ever changing array of amps and effects! For more Rig Rundown videos or to view Premier Guitar’s COMPLETELY FREE digital edition magazine, be sure to visit PremierGuitar.com. Want to know more about ZZ Top’s Billy F Gibbons and how he creates one of the most unique tones in Blues/Rock? 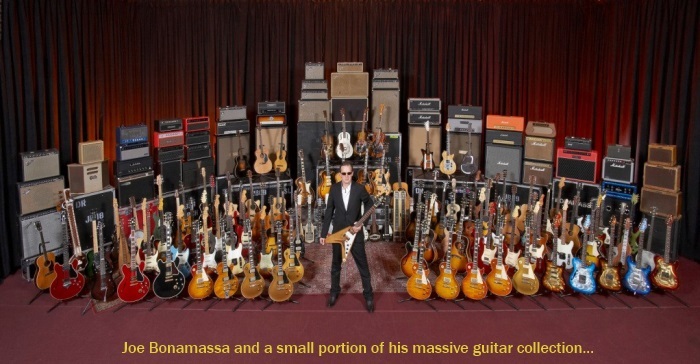 Click this link to read a free issue that includes a 10 page interview from 2002 where Billy describes the secrets behind his search for the ultimate tone. 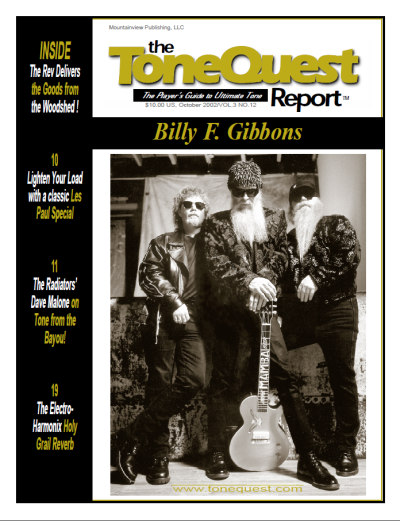 Subscribe to The Tonequest Report by CLICKING HERE. …a friend called and said he knew a farmer with an original Les Paul. He kept it under his bed and rarely played it. At that time I was driving an old 1930s Packard automobile, and I gave it to a girlfriend so she could get out to California to audition for a part in a movie. She made it and got the part, and swiftly sold the Packard and sent a check to me. I remember the day her letter arrived, and immediately struck out toward the farmer’s place and said, “How ‘bout $250 for that guitar?” He said, “Fine,” and that’s Pearly Gates. Even though that interview was from 2002, not much has changed for “The Reverend”. Here is a link to a recent video from Premier Guitar where Billy’s tech, Elwood Francis, runs through Bill’s live rig. This is 17 minutes of pure heaven for tone searchers… enjoy! Korg calls it “A Pocket-Sized Powerhouse of Tone”. With Korg’s REMS technology, the Pandora mini delivers an armada of world-class amp models and fantastic effects into a processor no bigger than your average MP3 player. Loaded with 158 types of amps and effects—with up to seven effects at once—Pandora mini ensures you’ll never run out of sounds. 200 presets get you started right out of the box, with another 200 slots for saving your own creations. It’s also got a built-in metronome and 100 rhythm patterns so you can get the most out of your practice sessions. Plug in your earbuds and jam or practice anywhere, anytime. Plug Pandora mini into your amp and share your sounds with the world, or take it into the studio and make each track a masterpiece. The Ernie Ball Gig Bag Amp with Marshall Electronics! Check out Ernie Ball’s newest product–the Gigbag Amp! This new Ernie Ball accessory allows a guitarist to plug and play anywhere. It has a built-in custom two-channel Marshall amp that features three controls–Tone, Volume, and Gain. It also has a dedicated MP3 input so you can jam along to your favorite tracks and a headphone jack so you can practice privately. And it doubles as an amp stand because when it is empty the bottom of the bag and be clipped to the top, creating a triangular amp stand that can help project your tones. Pretty ingenious product if you ask me. Here is a fun video that takes you “up close and personal” to watch JoeB’s hands in action on an acoustic guitar. This was filmed at the Hard Rock in Hollywood,FL with a Go Pro Camera on Joe’s Guitar. Watch more on Joe’s “JB TV” Channel on YouTube. I am starting to sort through all of the stuff I brought back from this years NAMM show. 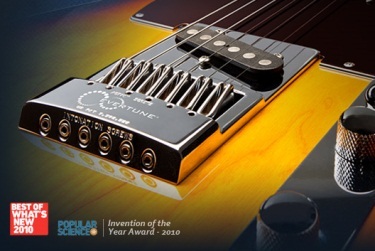 One of the most amazing products was the Evertune bridge. EverTune is a simple concept that keeps a string in tune until it needs to be changed. It is a very exciting development in stringed instrument technology. Self-tuning guitars have been available since the late ’80s but have failed to gain traction among players because of their complexity. Gibson’s Robot Guitar system, for example, requires a rechargeable battery to power an onboard computer and motors that retune the instrument. EverTune, however, is a purely mechanical spring-and-lever system: when a string stretches or slips, the springs apply the opposing force necessary to compensate for the shift, thus maintaining the correct tension and tuning. EverTune is a passive, all mechanical system based on trigonometry and some rudimentary physics. Hence it is a new technology that is actually old school, its main component being a spring set in a clever position. The benefits of this old school, all mechanical solution are that it is very rugged and reliable with only one moving part, and with all critical parts being made from high quality steel. It is also relatively reasonable in price, as opposed to servo-based (robotic) systems, and extremely effective. Bridges cost $330 plus installation — which is currently being offered for $59.95 plus shipping/insurance. 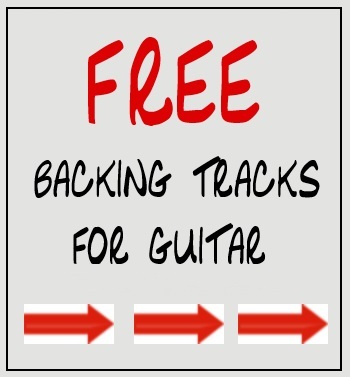 For more information, visit the Evertune Web Site.